What can you tell us about the upcoming film Christmas with the Dead and your role in it? The film, based on Joe Lansdale�s [Joe R. Lansdale interview - click here] story, is about letting go of the past, dealing with the present, and preparing for the future� and there are the zombies. I play the part of Ray, Calvin's neighbor. How would you describe your approach to your character, both before and after zombification? Before zombification, fear and panic dominated reasoning and inhibited focus. After zombification, almost everything that could be focused upon was simply ignored. 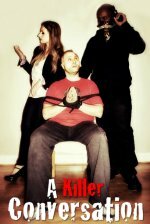 How did you get pulled into the project, and did you have any prior acting experiences? I read the script and liked it. I had done some work on stage, but never before in a motion picture. After a few auditions, I was asked to memorize lines. 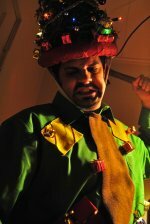 Though being a Christmas-themed movie, Christmas with the Dead was filmed (and is set) in the heat of of the Texan June. Was the heat at all taxing to you personally? No more than usual. 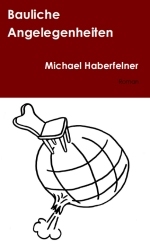 Just like anything else, you adapt to the heat and overcome it� without griping excessively or hurting innocent bystanders. Most of the Lansdale-family was involved in some way or another in Christmas with the Dead. Did it at all feel like a family-movie, and what can you tell us about the atmosphere on set? Since this was my first involvement, it just felt like a movie. I imagine that being a family member helped to clear the lines of communication. Being part of the film, it was easy to understand all that was required of my wife and to know when to give space. The S.F.A. film crew members were always respectful and accommodating. 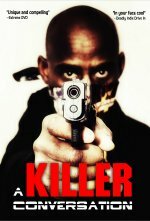 A few words about your director Terrill Lee Lankford [Terrill Lee Lankford interview - click here]? Lankford was Tenacious (with a capital T). He was determined to get the shots he needed, no matter what it took. He made it clear from the beginning that he wanted to make something that we could all be proud of. 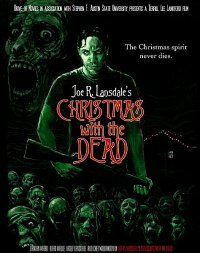 I guess due to family ties, you must have read some of Joe R. Lansdale's books [Joe R. Lansdale interview - click here], but were you familiar with his story Christmas with the Dead prior to filming, and your thoughts about it? Christmas with the Dead sat quietly on my book shelf and minded its own business. Then one day it jumped out, grew fangs, and bit me on the leg. I�ve kept my eye on that shelf ever since. 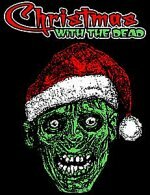 With Christmas with the Dead being essentially a zombie movie - is the zombie genre at all dear to you, and your genre favourites? I like a strong character more so than genres. I�ll walk to any section of the movie store if needed. I've heard that in your "real" life you are a science teacher. What can you tell us about Adam Coats, the teacher, and your scientific take on zombies? Well, let�s take your skin. The epithelial cells on the surface are keratinized for moisturizing purposes, and consequently, are highly resistant to nutrient intake. Being avascular, they completely rely on the diffusion of life-giving materials from underlying cells. This is their struggle. As more cells are produced from below, these surface cells are pushed further and further away from their food source� to the point of starvation. They die and become particulate matter in our favorite recliners. Zombies, much like the cells of our skin, need sustenance to exist. The further they�re removed from humans, the more sluggish they become. Class dismissed. Any future film projects lined up at all? Like I said, I�m watching that shelf. Clooney�s Batman and Robin, Pauly Shore�s Bio-Dome.